Reports: Usain Bolt's FIFA 19 stats leaked? Olympic star Usain Bolt may be making his debut on EA Sports' famous franchise - FIFA on their 2018 September release. The fastest man on the planet is currently training with Australian League side Central Coast Mariners as a Left Winger and is expected to get a full-time contract. He recently made his debut as a substitute for the Mariners against an amateur team on 31st August 2018. Football fans around the world are excited by this news. However, fans of EA Sports' FIFA franchise are raising questions if the Jamaican speedster would be in the 2019 iteration of their favorite football game. It is quite unsure whether Bolt would actually make it into the final game since he has not yet signed a professional contract with the Australian club. Recently a Twitter account Soccer AM tweeted an image of his "leaked" card online. As one can imagine, Bolt, quite fittingly, has an astonishing pace of 99. This is the maximum stat one can possess in the game. However, his overall rating is a meager 49. His shooting stat is just 40, passing stat is even lesser - just 35. His physical is his second best stat at 76. His dribbling stat is 57 - which is not bad for someone who never played football professionally yet. His defending stat is 18, which is normal for a forward player. 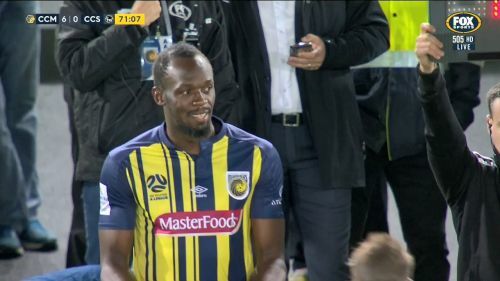 Even though the head coach of Central Coast Mariners, Mike Mulvey has given 12 months for Usain Bolt to prove his worth, Bolt has not yet signed a professional contract. This means the Olympic medalist is not a part of the Mariner's roster yet. So the chances of the Jamaican superstar appearing in the game is rather negligible since EA is very sensitive in these matters. That being said, we would love if Bolt actually makes an appearance in the game since his "leaked" stats are not game breaking by any means. FIFA 19 will be released globally on 28th of this month. People from all over the world have already pre-ordered the game. For our Jamaican speedster, his ambition to play professional football is definitely noted by the chief executive of the club, Shaun Mielekamp. If everything goes well, we will be seeing Usain Bolt playing professional football as early as the next season of A-League. How FIFA 19 messed up player ratings again.